You know we all have these moments when we feel that we won’t make it to an event on time, but it turns out wrong? This was one of those for me. I left home at 6:00 AM. I got a ride to the bus stop from my father. The sun had decided to wake up late. It was super dark and was just my watch that supported the fact that it was morning and not late in the night. Luckily, I got a bus to the Majestic Bus Stand without waiting for long. I boarded the bus with much enthusiasm, looking forward for an adventurous climb with a bunch of (hopefully fun) girls. Unlucky me, the bus driver did not share my enthusiasm. The speed of the bus clearly indicated that. To add to my agony, I had no knowledge of how to the get to the Majestic Railway Station. I am a Bangalorean, yes, yet did not know the route (True story!). The team was scheduled to meet at 7:00 AM, and I knew none would wait as we were to take the train. I thought “What will I do if I miss the train?” There was no answer to that. I could not think of anything at all. And the bus driver made no attempt to make me feel better! I got off the bus as quickly as possible at Majestic and made a telephone call for directions. With no courage to take a glance at my watch, I took the path. When I reached the meeting spot at the station, I couldn’t find a single girl who even remotely looked like she was going on a trek. Shocked! What now? Now I had to gather courage to at least see by how much time I missed the girls. The time was 6:45! The train started on time—7:45 AM (I was unaware of the 45-minutes wait period. Actually nobody did, except for the organizers). We had an extremely dramatic start. Thanks to the ninth and the last member, (the very romantic) Archana aka Corporation, who climbed onto the running train with (our hero) Sreemoyee giving her a hand. You can run a DDLJ or Jab We Met scene in your head. It was exactly like that. The journey was short and extremely talkative ;). All the ladies felt free to introduce themselves to each other. Actually, we more than introduced ourselves to each other. A lot of talk happened—some serious, mostly fun, and some seriously fun! We got back on track and began to move upward. 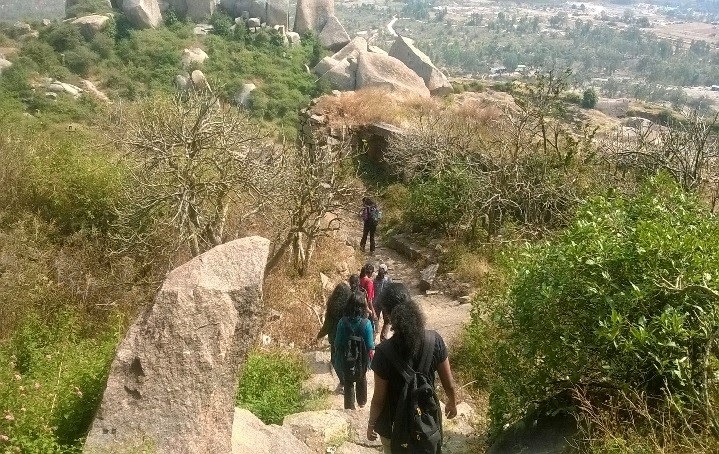 We came across a cave darga that was almost enclosed by three huge rocks one of which served as the path to the peak. After a short stop at the darga, we climbed the rock. Archana, Divya, Kulsum, Namratha, Ramya, Shoba, Sreemoyee, Sushma and I settled down as it was time for refuelling. We had the transformed rice for lunch—vegetable rice that was packed in the name of tomato rice at the hotel at the foothills. Since we had a National Karate Champion in our tem, we had to do some stunts and get them photographed! We captured our muscle power at the peak before descending. The downward walk was relatively easy. We stopped at just one spot. A short detour from our path led us to a darga. This was a modern-day structure just opposite to the huge pond that we saw earlier from the landing. On the darga’s right is a temple—Siddeshwara temple. This is a modern construction too. 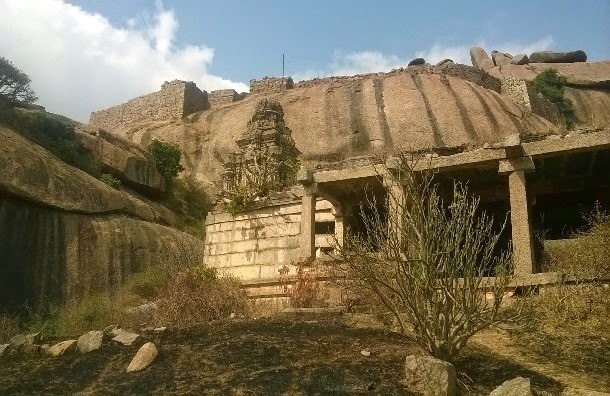 At a short distance, toward the left of the darga, lying on a huge rock was yet another ancient temple. 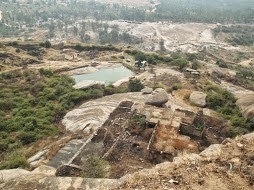 This structure was intact as compared to the remains of the temple seen before. On reaching this piece of architecture, we found a Shiva linga in one of the two inner sanctums, covered in layers of sand. The other sanctum was empty. In fact it had been dug. The stone pillars had many intricate carvings. Such a beauty it must have been in the 18th century for sure! In the next 15 minutes the nine of us were packed in an auto heading toward the railway station. Since we had an hour’s time till the train arrived, we took a detour to the bus stop. The bus to Bangalore arrived without much delay. The journey back was peaceful and not so talkative ;). And all the WOWsome ladies carried home adventurous, architechtural memories!